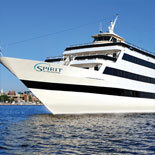 Spirit Cruises of Philadelphia offers an entertaining mix of dining, dancing and sightseeing along the Delaware River. The three climate-controlled, enclosed decks can accommodate 550 passengers, which enable the ships to sail rain or shine. Guests can dine alfresco on the open-air upper level and stroll on the fore and aft decks. Throughout the voyage, passengers can enjoy marvelous views of some of Philadelphia’s most famous landmarks. In addition to a breathtaking panoramic view of the city skyline, guests can see the warships docked in the Philadelphia Navy Yard and the historic Battleship USS New Jersey. Other popular attractions on the route include the New Jersey State Aquarium and Fort Mifflin, which is the oldest active military base in the United States. You will also get an up-close look at the Benjamin Franklin and Walt Whitman Bridges. Guests can enjoy a 2-hour lunchtime tour or the 3-hour evening cruise. After a bon voyage send off from the Penn Landing dock, guests enjoy a variety of entertainment while enjoying the lavish buffet prepared by the executive chef and onboard galley staff. The atmosphere evokes the glamorous era of traveling on a majestic ocean liner. The menu includes an assortment of entrées and desert items. With advanced notice, the cruise can accommodate special menu requests, such as kosher meals or alternate selections for passengers with allergies. The entertainment varies based upon the type of cruise that you select. There are numerous dining and cruise options available throughout the year, such as lunchtime gospel cruises and romantic evening voyages. You can hear live performances by some of the areas up-and-coming stars and DJs as they mix a sampling of the most popular musical genres. Spirit Cruises of Philadelphia is a unique way to explore this historic city.